Welcome! 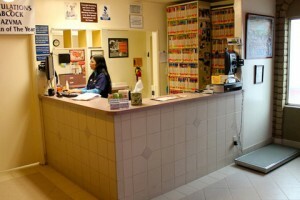 Thank you for choosing Palo Verde Animal Hospital for your pet’s care. Not computer savvy? No problem. Feel free to call our veterinary clinic at 602-944-9661 to book an appointment and we’ll gather the registration information over the phone. If your pet(s) travel (or have traveled) out of the area, where? PROFESSIONAL FEES ARE DUE AT THE TIME SERVICES ARE RENDERED. In cases of extensive medical or surgical procedures, when full payment may be difficult at discharge, we accept Visa, Master Card, Discover, American Express or CareCredit. There will be a $30.00 service charge for any check returned unpaid. If you fail to pay any sum due and this matter is placed with a collection agency, or an attorney for collections, you shall be obligated and agree to pay for all costs and expenses incurred (including a collection fee, plus all attorney’s fees, court costs and other expenses through judgment and post-judgment), which shall be payable whether or not an action or proceeding is commenced or prosecuted to judgment. Any balance remaining on the account over 30 days will result in a monthly service charge. A $7.50 minimum or 1.75% service fee of the unpaid balance, whichever is greater, will be added to the outstanding balance. The service fee is not intended to be an interest charge, but reimbursement for servicing the account. If you have other pets in your household, please list them below.